What is it about the civil rights movement that Americans in general , even within some sectors of the African American community, seem to discount so quickly in terms of its relevance, its remembrance, and its place in American History? Is it because it is about black people? Is it because it makes us uncomfortable about a dark side of American history? Is it because society has not quite live up to the dream, including some of the descendants of those within the black community? Do we truly believe racism is over? Do we really believe that everyone has an equal opportunity? Selma, the movie, brings all these questions up. It does a good job of telling the story of a certain part of the civil rights movement in the person of Martin Luther King, Jr. and some of his followers with the backdrop of the momentous Selma incident to gain voting rights for African Americans. It takes the viewer on a very, personal and emotional trail of tears through what is both horrific in the amount of hate spewed out because of race hating and also injustice during that period of our history. It also shows how the vision and leadership of one man, a leader of his time inspired a generation to stand up and make changes through peaceful, civil disobedience. It also showed that leaders are flawed and have weaknesses and that, even with those weaknesses can accomplish much. The civil rights movement might have been led by King but it was accomplished by the united force of every day Americans who had enough and decided to do something about it. That is why the message is relevant today. In an age of cynicism and big brother like conditions, many feel that their voice is muted and of no value or import. However, Selma shows that even in the most relentlessly cruel and overbearing situations, individuals can lend their voice and unite from all walks of life to change ideas and society. I thought as a film Selma deserved more recognition then it is getting and I believe that it is suffering from the Civil Rightsitis that seems to have taken a grip on this nation where somehow this part of our history has become a tired subject. Apparently, the members of the Academy has caught it as well. Fortunately, the film got a Best Picture nod. Unfortunately, its Director (Ava DuVernay) and lead actor (David Oyelowo ) were overlooked. Both more than deserved to be nominated. But , alas, these award shows may sometimes be less than about talent and quality but other things. 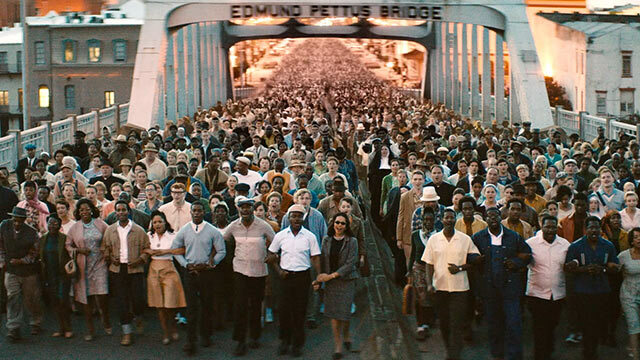 However as a film, Selma deserves to be seen over and over again by America, every year as a reminder about a movement that is still ongoing in some form. Racism still exists. Equality in so many ways, even beyond race, has not been achieved. The individual and common man and woman voice can still count. United they can make a difference. “Our lives are not fully lived if we’re not willing to die for those we love, for what we believe”.